When on Ibiza, eat like the locals and try some delicious small plates of tapas and pinchos. Yum! 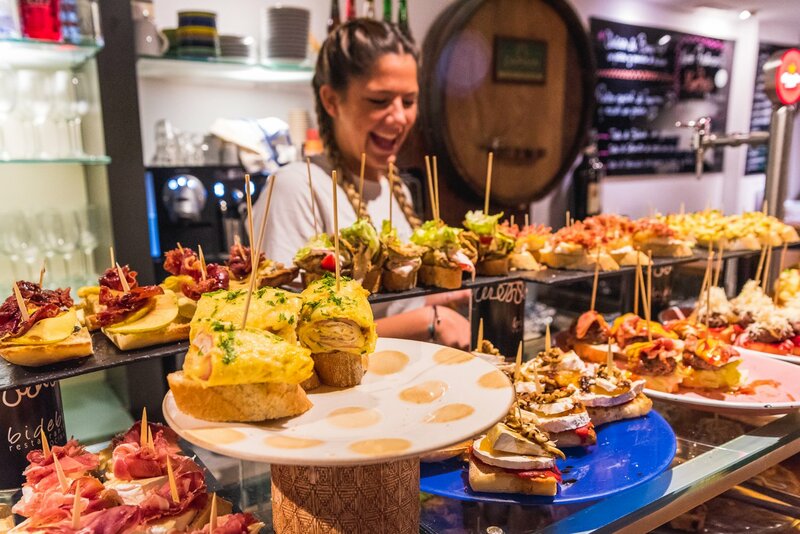 On any holiday to Ibiza, it's really worth seeking out some top places for Spanish tapas and pinchos (Basque-style tapas) and when in Ibiza Town, you will find them all over. We decided to do it the traditional way, going from bar to bar to have just one with a drink in different places. Thanks to the generosity of places we visited, we fell short of that target, having at least three per venue and if you do that, our advice is to have an elasticated waist on whatever you are wearing on your bottom half. Of course, most times, you will just want to eat in the one place and you can do just that with each of the five places we visited. Each are in and around the port area of Ibiza Town, so can be easily reached if you want to do more than one. So, join us on our odyssey of some of the top places to get your ration of tasty tapas or pinchos that will satisfy even the hungriest of appetites. This place could not be more picturesque, with brightly coloured pouffes and small sofas, literally outside on the steps. S'Escalinata is high up in the walled citadel of Dalt Vila, hugely atmospheric and nicely informal. Everything is home made and it shows. We tried some lovely tapas of hummus and guacamole, the latter of which came topped with hibiscus salt and was really delicious. Do try the gorgeous salami, it's of the highest quality and tastes incredible. As well as tapas, you will see a great range of Italian influenced sandwiches, or bocatas made with bread that's crusty on the outside and soft on the inside. Ours was filled with tomato and mozzarella and melted in the mouth. Pricing here is very reasonable and the owners are very keen to keep it that way. You also simply must try one of the cocktails which are made with real love. The “mezcal mule” is a knockout. Ask anyone who has been to Can Terra what they think and you will inevitably see a broad smile take over their faces. This is a terrifically well-priced place for pinchos and it's open from morning to evening. Inside, it's a long line of tables in a modern and rustic setting. Oppposite these is the long counter where pinchos are piled up and eaten up very happily by the contented customers. The pinchos here aren't the biggest, but then the price is low and three or four of these will more than fill you along with a glass of beer or wine or two. Goat's cheese with caramelised onion is a delight and a classic plus there are even more modern ones like spring roll and seaweed as toppings on the sliced bread. Open all year round. Despite the almost Japanese sounding name, Kaixo means “hello” in Euskera, the Basque language. The food at Kaixo Ibiza is strongly influenced by this region and it is a true tapas place and one where you would go to have a decent dinner or lunch without wanting to move. There's lots of space inside and out on the covered terrace with regular tables and taller ones with stools. It's a place that exudes class and has a great menu, where real care has gone into developing it. Oh and the food. It's a wow place and the presentation is really good, resulting in some very pretty dishes. The deep fried prawns we had were unusually, encrusted with a fine baklava-like pastry. Chicory with soft cheese, apple, celery and walnut was deeply refreshing and the “broken” eggs with Iberian ham, a classic, came as a stack and was fantastic. Definitely one for the list of places to eat in Ibiza Town and it's open all year. There's a menu of mains at Bide Bide but we were there for its gorgeous pinchos, which are truly loaded with some fine toppings. On the side street, up from Ibiza's port, this small place is very popular and it's open all year. Here, it is really hard to know what to choose, with a wide selection of cold pinchos with everything you could think of. I had a wonderful one with mashed potato stuffed with minced meat and cheese and a roll of ham and cheese, deep fried. Our photographer dived into one with deep fried courgette and baby eel. Also, it's worth checking out the menu for the warm tapas. We had one called a cojonudo, which is chorizo, red pepper and fried quail's egg. If you haven't tried it yet, we strongly suggest you do. Some really nice wine by the glass here makes for your perfect eating accompaniment. The informality of La Bodega greets you like an old friend. Inside it's an eclectic mix of decor that's constantly being added to each year. Many customers have been going here for an age and it attracts a very mixed crowd, all here for the great tapas. We had a mix of some very traditional plates like mini chorizo sausages (choricitos) and a very generous patatas bravas, cubed potatoes with an excellently prepared spicy sauce plus a very moist tortilla. The tomato and mozarella was topped with some good quality salmon and the herby, melted cheese dish, “provoleta” was indulgence itself. It's in a lovely old building with a creeping vine and is unmistakable at the foot of the rampart that takes you into the old city. The floors are well-trodden stone flags and there's a great range of quality booze and some nice cocktails on offer too. For whatever type of cuisine and price range you are looking for, Ibiza really does have it all - check out our restaurant guide for a world of options to suit all palates.